MONKEYS ARE MY FRIEND: Knitting Magic! I've been working diligently on my socks and have gotten quite a bit done. Today I got to experience the magic of turning a heel first hand! 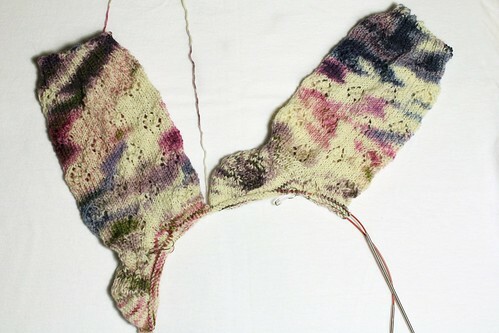 Turning the heel is knitting the shaping that makes the heel of the sock actually heel-shaped. Logically, I knew how it was done, but apparently I'm a hands on learner cause it didn't click 100% until this afternoon when my socks magically developed heels! Also, I have to say that this pattern has the most adorable heel flaps. It starts as 2/2 ribbing and uses six cables over ten rows to make the rib cross and twine then separate back to 2/2 ribbing. Sadly, though, since my yarn is multi-colored the ribbing and cables don't photograph all that well. But still, amazingly cute. I still have a ways to go - I'm just now shaping the gusset then have the normal foot portion and the toes, but I'm hoping to get these done maybe by the end of the month. Too exciting!